Well isn’t that just the peachy truth! and you got a bad taste in your mouth, literally, and never wanted to try one again. No matter your personal experience with them, peaches have quite a bit going for them. They are known to work against and prevent diabetes, metabolic syndrome, cardiovascular disease, combat radicals related to cancer, and aid in skin and eye health. Peaches truly are a wonder for the body both internally and externally. One cup of a peach sliced up equates to around 60 calories and has high antioxidants, potassium, magnesium, vitamins A, E, C, and K.
So let’s talk about how you can get the most out of peaches and hopefully pass on the right experiences to your young ones. Many people associate summer as the best time of the year to buy peaches – this peak time is when you will bite into the freshest flavor and most potent nutritious value. Peaches should have “taut, fuzzy skin that gives slightly when pressed.” If you can tell the peaches aren’t quite ripe, they will ripen much faster if they are placed in a bag near the kitchen windowsill to provide lots of sunshine. The bag helps to protect the peaches from receiving too much light at the same time. Enter the early 17th century where the England horticulturist, George Minifie took peaches to America to be first planted in Virginia. American Indian tribes helped spread peaches and their crops across the US. Closer to the 19th century, commercial production of planting peach seeds became a staple in Maryland, Delaware, Virginia, and Georgia. From there, peaches slowly made it on to other sunny states and are now grown for production everywhere from California to South Carolina to Washington state. 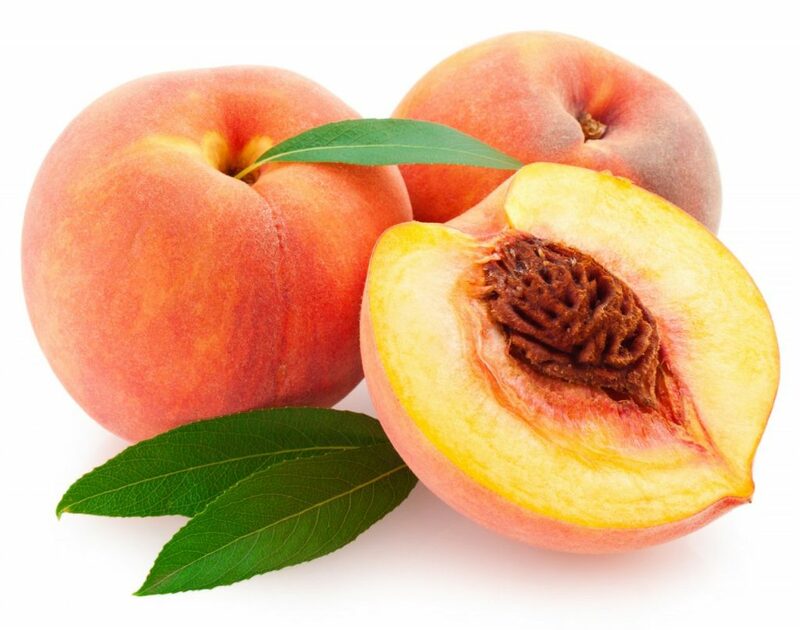 Peaches are part of the stone fruit family, such as plums, apricots, and cherries because they are considered drupes, their flesh surrounding a hard seed. You may have noticed that peaches have a few different varieties – mainly white and yellow peaches. White peaches are known to be on the sweeter side, while yellow peaches can lean more on the tart side. An interesting fact to note when selecting your peaches – smell them! Yep – right there in the store. The sweeter the smell, the riper they are! Avoid peaches that have brown spots or are bruised. Peaches do continue to ripen after they have been picked, so you can always buy ahead of time and plan the meal that incorporates peaches on your schedule. No matter your experience with peaches, we hope after reading this you give them another go – perhaps start with white peaches during peak season and slice one up for dessert one summer night. There’s nothing a fresh peach can’t fix, we say!